Makaha Elementary students get 40 minutes to play if they eat lunch quickly, getting a choice of activities spread across the field. 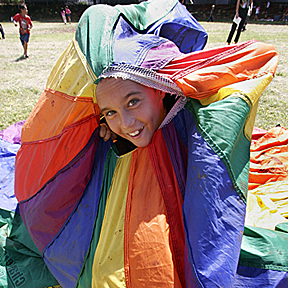 Tony Akuna has fun while wrapped up in a parachute used in one of the games. Two sacred staffs topped with golden orbs that for more than 113 years watched over the crypt of the royal line of Kamehameha are missing and believed stolen. A mother and her adopted daughter are bonding to open a maternity store in Kailua. The state Water Commission has approved plans to use drinking-quality water for two new golf courses.